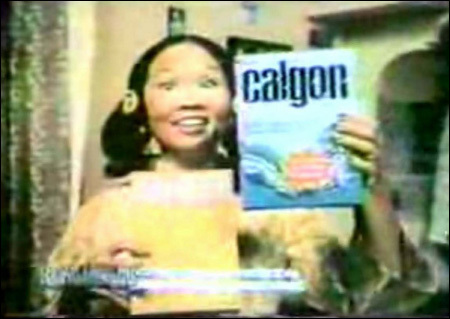 This Calgon ad is a classic. But if you dissect it, it's also pretty funny. So the guy (nice feathered hair, by the way) owns a dry cleaner, but he washes the clothes in a regular-sized washer in the back? And uses small boxes of Calgon? And his wife hates him so much she calls him on his lie right in front of a customer? Most commercials, both modern and vintage, don't really stand up to that kind of scrutiny, and thank heavens they don't. Also, apparently this is not the same Calgon in "Calgon, take me away!" I was just thinking about this ad the other day when I saw Dan Adler's ad - apparently Jewish candidates are the NEW Chinese secret. Or something like that?